XS News isn’t as powerful and flexible as other Usenet services, but nevertheless it gets the job done. This outfit is a popular European provider based in the Netherlands, offering a range of Usenet services that get the job done and remain affordable at the same time. However, its servers are located in the Netherlands, meaning that if you aren’t living in Europe, you may find performance is slower than other providers with a better global reach. 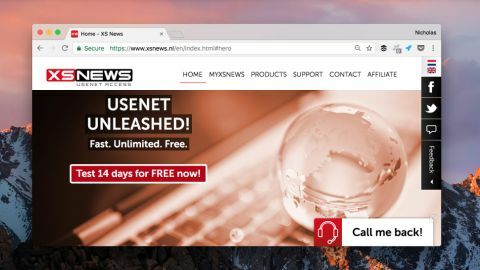 XS News describes itself as a ‘Usenet access platform’, providing you with the tools to fire up downloads without any speed or data limits (depending on the exact plan you pick, of course). It also places a major emphasis on simplicity and customer satisfaction, with online tech support forums being offered in both Dutch and English. With this platform, you get a binary retention rate of 1,100 days, which is substantially lower than other providers. Nowadays, you can get Usenet services offering more than 3,000 days of retention. Still, if you only plan on using XS News’ servers lightly, then you shouldn’t have any real problems. While it doesn’t have the best retention rate, that’s not to say that XS News disappoints altogether. On the positive front, you get access to over 200,000 newsgroups, which is more than some providers – so you’ll have plenty of opportunities to find and share quality content. In terms of raw performance, the company offers unlimited speeds with its top-end plan. The issue, however, is that the service is probably not going to perform quite so well if you’re based away from Europe, as we’ve already mentioned. Providers such as Astraweb are more international, and it’s worth checking out the competition if this is a concern for you. Should you want a provider that puts security first, then you’ll be happy with XS News. Although there isn’t a VPN service available here, as there is with some offerings, all users are given free SSL connections (and although that isn’t uncommon with Usenet providers, it’s still something to see as a positive). XS News offers both flat rate and block accounts, which means you have a number of options. The basic flat rate package costs €4.45 (£3.85, $4.80) per month, giving you eight connections and 8Mbps speed. Realistically, that won’t be enough for most, but it’s a good choice for newbies. The most expensive flat rate option will set you back €8.20 (£7, $8.70) per month, and for that, you get 30 connections and unlimited speed. If you’re looking to use the service heavily, then a block account may be more suitable. They all come with unlimited speeds and go up to 20 connections, with prices starting at €9.95 (£8.65, $10.70). Whatever plan you’re thinking of, you can benefit from a 14-day free trial to see if the service fits the bill. XS News may be a respected and popular service, but it also happens to be one of the least powerful contenders on the market. While it offers relatively decent performance and account options, the fact that it’s Europe-centric will make it less ideal for some. It’s also lacking on the retention front, and you’ll find that other services offer better value-for-money.